A particular gastrointestinal disorder, which causes colic, or abdominal pain, in horses, is more prevalent in Lancashire compared with other nearby counties, according to researchers at the University of Liverpool and Lancaster University. They have also found that Idiopathic Focal Eosinophilic Enteritis (IFEE), lesions causing an obstruction in a horse’s small intestine, is actually seasonal and occurs more often in younger horses. The findings emerged from a collaborative study involving equine specialist Professor Debbie Archer from the University’s Institute of Infection and Global Health and Lancaster University statisticians Dr Deborah Costain and Dr Chris Sherlock. The results have been published in the journal Plos ONE. 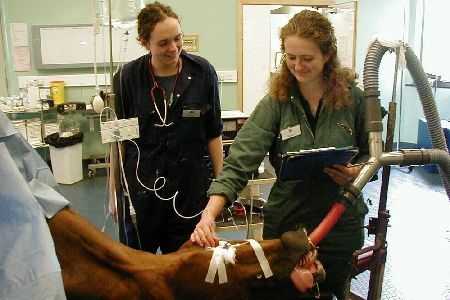 The study used data from horses and ponies admitted over a 10-year period to the University’s Equine Hospital for exploratory examinations to investigate the cause of colic. Of these, 85 were IFEE cases and, for the study, a further 848 subjects were selected at random from those without IFEE. The cause of IFEE is currently unknown and the aim of the study was to examine the effects of age, time of year and geographical location on the risk of the condition. The data analysis used advanced techniques in spatial statistics, a particular specialism of Lancaster University. “This work enables us to better identify horses at risk of IFEE and has provided some clues about the possible cause of the condition which requires further research,” said Professor Archer. The study, which covered a region from Leicestershire to Cumbria, showed there was an increased risk of this particular gastrointestinal disorder in horses from around Lancashire. It added that as factors, such as breed, management practices and feed types, were unlikely to vary according to the observed spatial distribution, it was plausible that environmental factors might play a role in the development of IFEE. The report suggested that future research should, therefore, consider investigation of environmental factors such as soil types and pathogens associated with similar spatial patterns of disease in other species, including humans. A seasonal pattern was evident with the greatest risk of IFEE being identified between July and November. The risk of IFEE was found to decrease with increasing age, with younger horses, from birth to five years old, being at greatest risk. Colic is one of the most common causes of death in horses and ponies and has important economic costs and welfare implications for the equine industry and horse/pony owners.